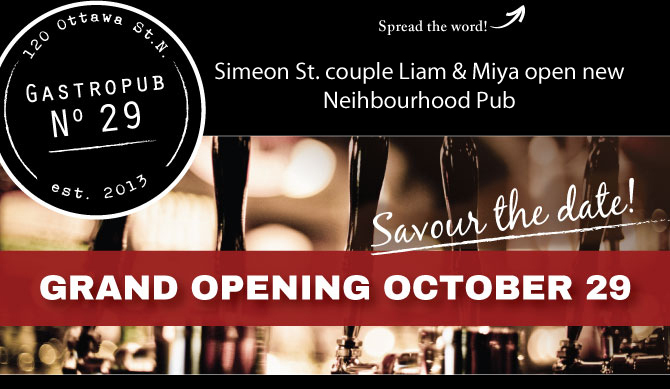 Dear ANA Neighbours — we provide you with a mid-summer update! The ANA had hopes to celebrate the amelioration of Knollwood Park at another annual Waddlefest this summer. However, some delay has become inevitable as necessary upgrades and repairs to Stirling Avenue and side streets continue and because the bid process and imminent construction of Knollwood Park’s crown jewel, the Pavilion, is now unfolding. Until August 15, 2014, interested parties may respond to the Bid/Tender opportunity posted now on the City of Kitchener’s website to supply all labour, equipment and materials as per specifications and drawings for the park’s pavilion. As many of you know, the ANA has worked closely with the City of Kitchener since the latter’s 2011 proposal to tear down the old Club (hydro) house at East and Stirling Avenues, a demolition which occurred in 2012. Now after some three years of neighbourhood consultations, fundraising and much participation, things are shaping up beautifully and we are poised to see a new skyline across Knollwood soon once the centrally placed pavilion is up. This summer, the ANA was also able to secure a further $2000 grant from the City of Kitchener after successfully submitting a proposal to their Safe and Healthy Community Advisory Committee for a message or notice board for Knollwood Park. While many ANA residents are apprised of new events through email, the ANA website or ANA Facebook page, there remains a vital constituency of our neighbourhood, who are not connected. To be placed at a prominent point along the new Knollwood path, the message board will become another spot where our bikers and walkers can stop and check for ANA news. The ANA aims to acquire and see such board erected along with or shortly on the heels of the Stirling construction clean up this fall. 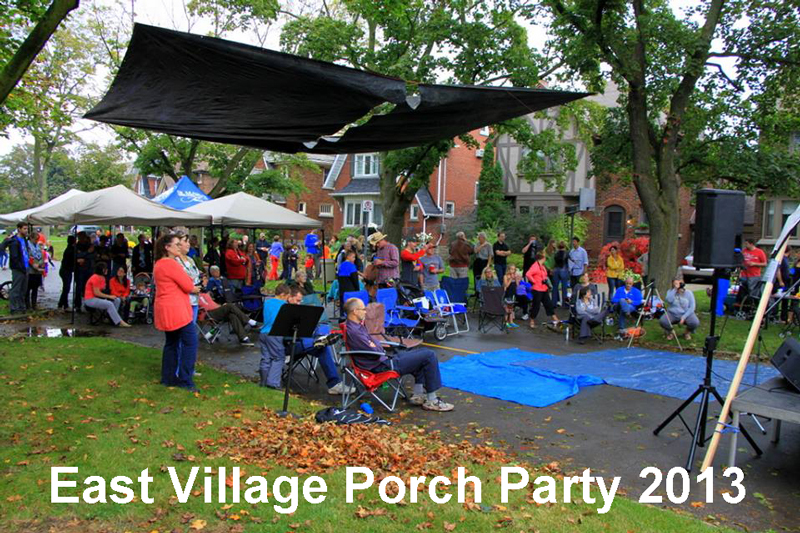 Given the above, Waddlefest will not occur until either the mid-fall or even spring 2015 when we are able to enjoy a safe and more settled venue for this neighbourhood celebration. It’ll be much more inviting to waddle through finished streets and catch up at the new meeting spot than to navigate treacherous terraine! All this said, the great grassroots musical Porch Party planning has gotten underway for September 14th. Many of you have already received Wayne Moffat’s recent solicitation by email, so ‘if you think you’ve got talent,’ please send him an email before August 22nd at wayne_moffat@rogers.com and set aside that date to participate in making or taking in some great vibes and meet your neighbours. More details will follow in upcoming weeks from Wayne and his cohorts. The Auditorium Neighbourhood received two awards at Sunday’s FESTIVAL OF NEIGHBOURHOODS Finale at City Hall. Our Knollwood Park Rejuvenation and Fundraising Campaing reveived the INCLUSION AWARD 2013, sponsored by the Independent Living Centre of Waterloo Region. This award wanted to recognize our efforts with establishing the trail, the pavilion and the berm to make the park more accesible, safe and attractive to diverse groups, for example in ability, age, culture, economic level and identity. 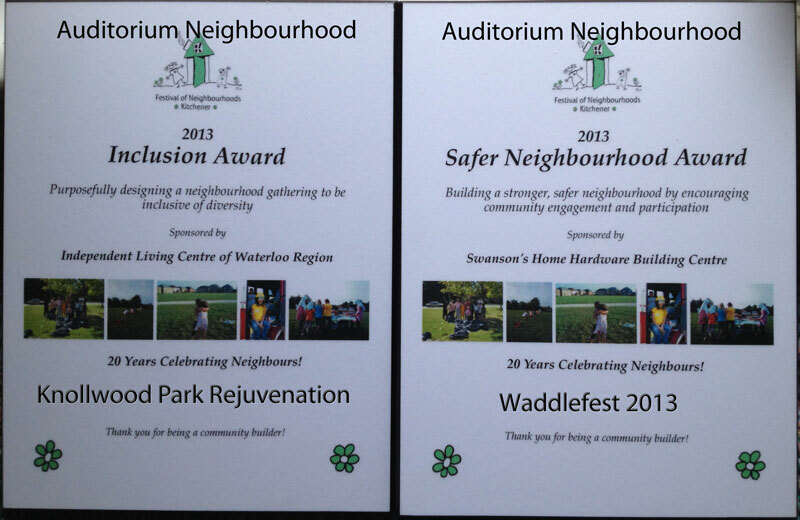 Waddlefest received the SAFER NEIGHBOURHOOD AWARD; sponsored by Swanson’s Home hardware Building Centre for creating an event with the purpose of building a stronger, safer neighbourhood by encouraging community engagement and participation. A big thank you to Wayne, Lisa, Rob, Tricia and everyone else who helped with this amazing party. Thanks for the wonderful food and bravo to all performers, including: Lisa Dal Bello, Kids Stage, The Two Soccer Dads, Kimberly Barber and Annika , i81, Zoe Ukulelezoe Janzen, The Impatient Wrist Band, Boat Yard Boys, Emma Cooper, Bob Mathers and the East Village House Band, The Cooper Family Band The 1.21 Jigawatts, Safe As Houses, Will Currie and the Country French. Join your neighbours in Knollwood Park behind Sheppard School, for an organized walk through the neighbourhood, games and fresh air.